BACKGROUND: Bill Griggs' parents were both professional musicians. His father, William B. Griggs, played trumpet in some name bands, then formed his own band in Connecticut before retiring. His mother, Emma Giel, played keyboards in Hartford, Connecticut and was known throughout New England. Bill feels this furnished the initial impetus for his interest in music as there was always music in the house. 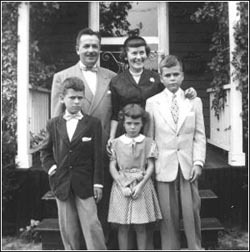 The Griggs family during the early 1950s. Father, Mother, brother Alan, Sister Jennifer, and me. None of the kids look happy having to dress up! 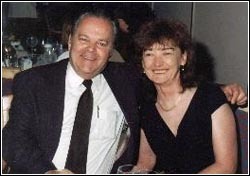 FAMILY: Bill was married in 1966 and has two children from that union, William F. Griggs II, and Holly Maria Griggs. He was divorced in 1990. His children now live in Connecticut. Bill married Sharon Reaume on June 3, 2004 and she helps him with his work and is always with him when he is attending a music event. They had been together for three years previous, got married, bought a house, and are very happy together. 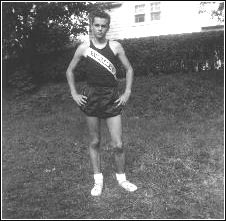 Bill was pretty skinny during his high school days when he was on the track team. Bill attended Bulkeley High School in Hartford, Connecticut, graduating in 1959. At school, he was President of the Astronomy Club, member of the Audio-Visual Squad and Radio Club, and was on their track, cross country, and tennis teams. It was during these years that he began frequenting the State Theater in Hartford for their rock ‘n’ roll concerts and getting to meet with many of the artists of the day. 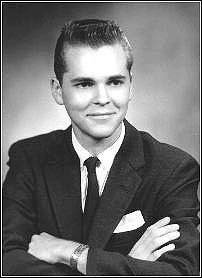 Bill's graduation photo from 1959. His hair is cut basically the same now, 45 years later.